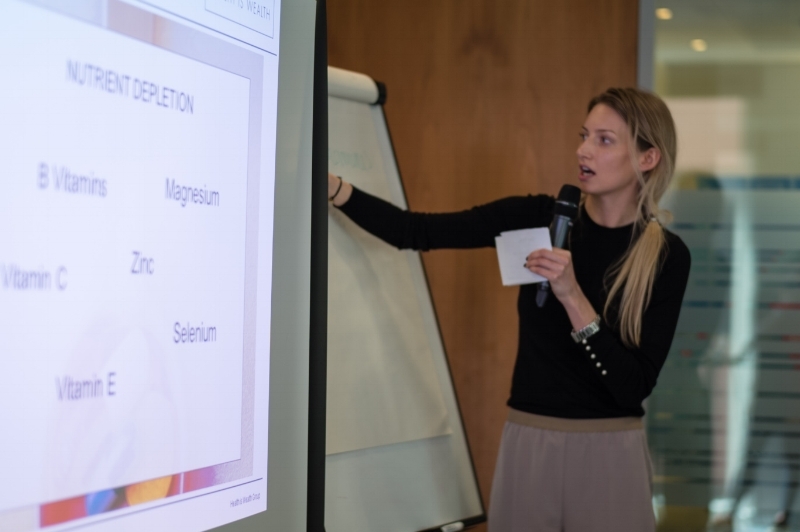 After studying biomedicine, naturopathy and nutrition Chloe joined the British Association for Nutritional Therapists. She practices functional medicine – in particular, the link between the microbiome, gut health and mental health. Having originally studied English and Classical Studies, Chloe suffered an accident in 2013 that later became a catalyst in changing her life’s direction. Several months of recovery time provided her with a unique opportunity to observe the world and the people around her. Witnessing the masses of stress, deadlines, electronic stimuli, sleeplessness, hangovers and people’s general disregard for their health in the quest to keep up with their colleagues and peers became clear. Cooking had been replaced with quick meals, human connections with screens and health with symptoms including fatigue, insomnia, IBS and irritability. What we eat can profoundly affect both the mind and the body and Chloe retrained as a Nutritional Therapist, completing three years of Biomedicine, Naturopathy and Nutritional Therapy. Chloe now practices Functional Medicine within a holistic model; exploring the link between the microbiome, gut health and mental health. Many of her clients suffer with bloating, IBS, SIBO and acid reflux, while others experience anxiety, or mild to moderate depression. Chloe recognises that for true wellness, food, sleep, movement and relaxation must be in harmony.